He has come here all the way from the little town of Dripping Springs, right on the threshold of Texas hill country. He is wearing regulation double-denim and a pair of desert boots. He looks a little like Dennis Wilson on the cover of Pacific Ocean Blue and a lot like Jesus from Nazareth. His name is Israel Nash and he is a holy rock’n’roller and one helluva modern-day mountain man. Israel Nash, who celebrated his 39th birthday earlier this month, is now a decade into a recording career that has produced five full-length records, the most recent of which, Lifted – released last July – certainly lived up to its name as it moved up into the higher reaches of many of those end-of-year album lists. The record has also brought the man from the Lone Star state to a much wider audience as is reflected by a respectable turn-out at the Brudenell on what is a very cold Sunday night in January. “Find the beautiful things in life,” Israel Nash suggests. “That is where you will find love.” He is not wrong, you know, and for 75 totally absorbing minutes tonight in his sweat-drenched musical company that is just exactly what we do. Nash and his band start the way they intend to go on with a mighty triple-fusillade of tunes taken from Lifted. ‘Lucky Ones’, ‘Spirit Falls’ and ‘Sweet Springs’ don’t even bother pausing for breath as the four musicians press pedal-to-metal with a rollicking, rolling blast of joyful noise that sounds just like The Stray Gators might well have done had they had both Black Oak Arkansas’s brand of southern boogie and Creedence Clearwater Revival’s swamp rock nestling alongside them during the recording of Neil Young’s Harvest album way back in 1971. The pace doesn’t slacken as the four musicians tear through ‘Rexanimarum’ and ‘Mansions’ before Nash finally relents and temporarily slows things down. The drummer and bass guitarist depart the stage, leaving just Nash and pedal steel guitarist Eric Swanson to prove that they are just at home with tender beauty as they are with hard-driving country rock. ‘Baltimore’ and ‘Goodbye Ghost’, both taken from Nash’s second album Barn Doors and Concrete Floors, are lovely exercises in ornate splendour. 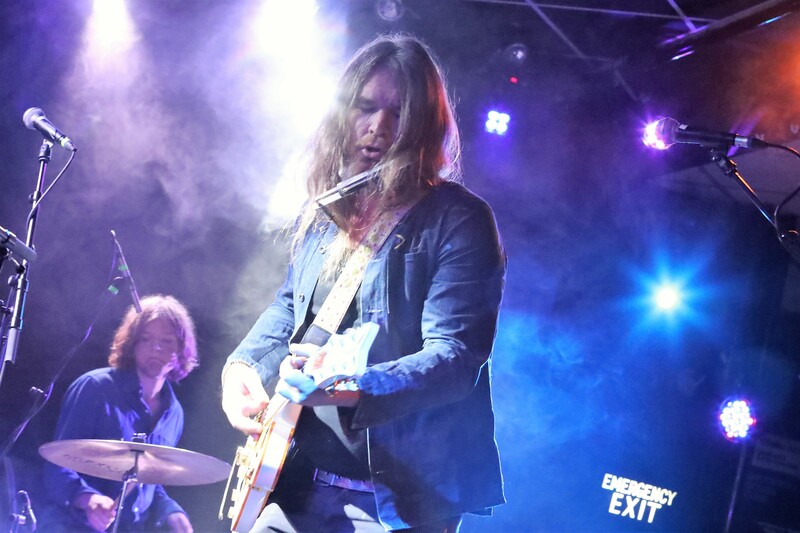 Once reunited with their rhythm section, the band then head for home, with Israel Nash’s weathered voice – sounding not unlike Dennis Wilson’s on Pacific Ocean Blue – and that big Snowcrest White Gretsch of his both acquiring an even greater resonance and depth. On ‘Rain Plans’ – the title track from Nash’s third long player – the guitar and pedal steel coalesce quite magnificently during the song’s thrilling conclusion. Israel Nash and his band finally bid us a very fond farewell with the perfectly apposite ‘Rolling On’ but not before they are joined on stage by Nash’s good buddy and label-mate Joana Serrat – who had earlier contributed much to the evening’s success with a delightfully intimate support slot – for an incredible reading of Radiohead’s ‘No Surprises’ that somehow manages to lift the song above its existential sense of desperation and despair.